Multitasking while cooking is essential with a fast-paced lifestyle, this can be achieved through the acquiring an ideal kitchen appliance that can keep up with your pace, and provide exactly what you need. With the Instant Pot IP-LUX60 6-in-1, preparing meals in the kitchen is made faster and easier. You come up with the healthiest and most delicious dishes with the least time spent on it. This electric pressure cooker not only meet your standards, but is an all-in-one appliance that will make you more efficient and productive in your everyday living. – Six-in-one computerized multi-function: Your electric pressure cooker can perform the functions of various other kitchen appliances such as: Sauté & warmer, steamer, rice cooker, slow cooker and pressure cooker. – 6Qt Inner Pot Capacity: Typically, the 6Quart vessel can hold liquid only up to the MAX line, but it could actually be filled with more than the required amount. This spacious pot is ideal for cooking food such as chicken, steaming vegetables, or pot roast where it may be necessary to add more liquids. – Easy to Use and Simple User Interface: The large control panel is quite easy to use, operated by just a push of a button, and you can cook a variety of recipes as you wish. Cook all kinds of food fast and easy with its 10 built-in Smart Programs in 3 adjustable modes. It also has 3 distinct temperatures ideal for saute/browning or for thickening, and 3 temperatures as well for slow cooking. You can do a manual setting of up to 120 minutes of cook time or delay it for up to 24 hours. – Dependable Results: Possessing contemporary 3rd generation technology, the IP-LUX60 is equipped with microprocessors that monitor the pressure and the pot’s temperature, adjusts heating intensity, duration and keeps track of the time. Food volume is accounted for as well. 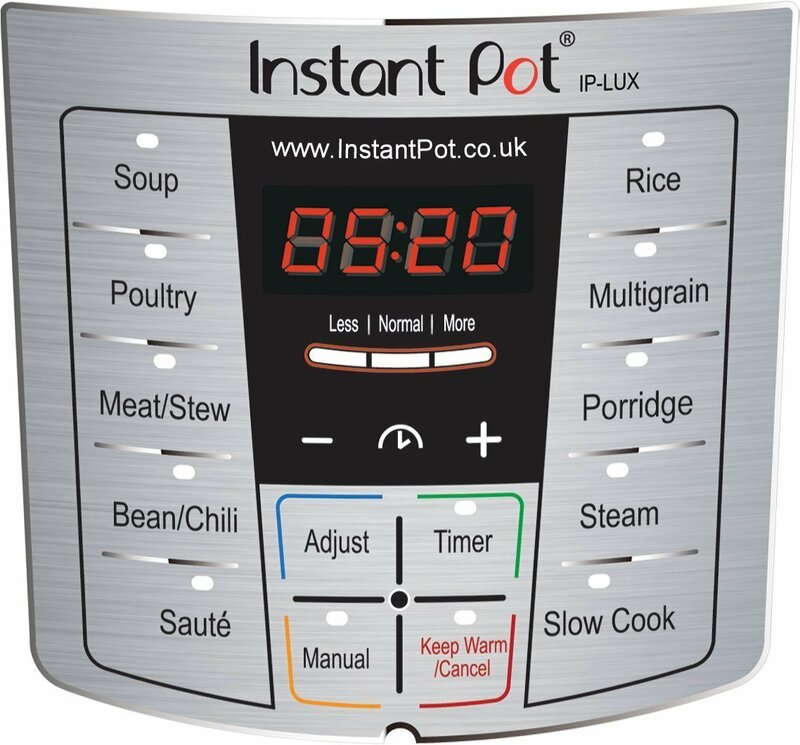 These great features to help you dramatically improve cooking results with 10 Micro Processor controlled cooking programs: Slow cook, rice, multigrain, steam, congee, bean/chili, poultry, sauté, soup and meat/stew. – Safety: UL and ULC certified along with proven and tested 10 safety mechanisms within its microprocessor controlled programs, plus the high quality materials and craftsmanship of this product minimizes risks in the kitchen. 6 Adjustable models: 3 sauté cooking temperature modes are 275~302°F, 320~349°F, 347~410°F and 3 low cooking temperature modes are 190~201°F, 194~205°F, 199~210°F. Measuring Scale: There is a measuring scale from 2 to 10 cups in American size scale inside the inner pot. 1000w heating element: Cooking fast with 1kw heating element. Stainless steel inner pot with a 3-ply bottom: Stainless steel inner pot with a 3-ply bottom makes it more durable. – It speeds up cooking by 2~6 times using up to 70% less energy, and, above all, produces nutritious healthy food in a convenient and consistent fashion. It is Safe, Convenient and Dependable. 6-in-1 Multi-Functional for a single kitchen appliance makes you cook faster than ever yet still produce tasty, healthy, impressive meals. – Automatic keep warm keeps your food fresh until ready to serve. Delight in its noiseless and steam-free operation. Indulge in the rich aroma of the food you are cooking and will be soon serving to your family or guests. Cleaning up won’t be difficult for you since its industrial design is fairly easy to clean. The stainless steel outer surface is awesome since it is fingerprint resistant. Getting the IP-LUX60 means you are getting a complete package. Your purchase entails the stainless steel made cooking pot and a steam rack, a rice paddle, measuring cup, and a soup spoon. The included user manual presents easy instructions. You also get cooking time tables and recipes. The manual, time table and recipe book arrives in various languages which are English, Spanish, Chinese and French. 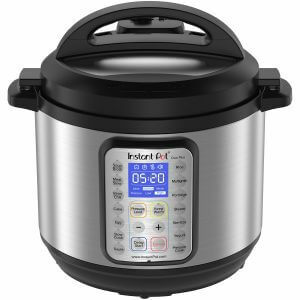 Instant Pot IP-LUX60 6-in-1 is a great choice for best cheap pressure cooker which possesses a multitude of features. It brings great convenience and is one dependable kitchen appliance. You can rely on it to serve the purpose you need, tailored for the food you would like to prepare. Concoct recipes exactly the way you want it. Aside from all its impressive capabilities and excellent benefits, its exquisite design and style will add elegance to your home. This versatile, unique pressure cooker is one good investment for a single appliance that will be your kitchen partner for years to come.